First impressions are hard to shake. More than likely, your first impression of University of Maryland Athletics is years of being atop the ACC in basketball. Football is the furthest thing from a person’s mind when they think of the University of Maryland. Former head coach, Randy Edsall, athletic director Kevin Anderson, and Under Armour CEO Kevin Plank aimed to change the overall perception of the University of Maryland football program by changing the way it communicated with recruits while infusing a sense of pride about being a Maryland Terrapins football player in the Washington DC metropolitan area. "Communicating and working with them feels like they’re an extension of our recruiting department." We faced several challenges with our campaign to rebrand the Maryland football program. Maryland is known to many as a basketball school first. The state of Maryland isn’t considered one of the blue blood high school football states. After 60+ years as a founding member of the ACC, the program was entering unfamiliar territory in its first season in the Big 10. The program’s brand identity, voice, communications and strategy across social and digital were nonexistent. Their content and messaging was managed by their athletics marketing department and its focus was on driving ticket sales, fundraising, and communicating with fans, alumni and sponsors — not the recruits or their families. This was hurting Maryland when it came to recruiting top tier talent. We wanted to change the perception of Maryland being “just a basketball school”. We wanted to help Maryland not only recruit the in the DMV and Mid-Atlantic but for their staff to be able to go into homes in the Midwest and recruit against their new rivals — Michigan, Ohio State, Penn State, and more. As an Under Armour flagship school, we needed to leverage our relationship with the sports apparel maker to our advantage and we also needed to create a “come home” mentality amongst Terrapin NFL alumni who served as brand advocates. Our overall objective was starting a movement amongst recruits by building a sense of pride and influencing them through targeted content that dictated becoming a Maryland Terp football player was the best decision to make if you were from the DMV area. 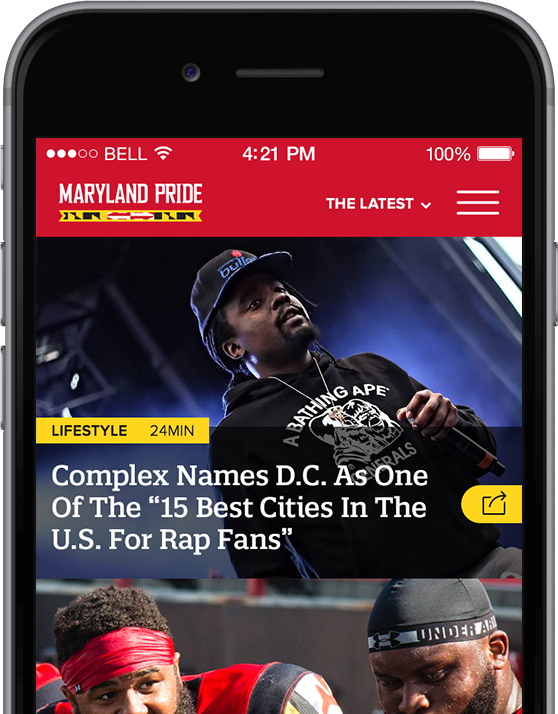 We created the #MarylandPride campaign which introduced an overwhelming sense of local pride among the DMV area football talent that would typically look elsewhere when it came to making their commitment on national signing day. The integrated marketing campaign told a vivid and visual story about the Maryland Terrapins through taglines, hashtags, authentic messaging, brand identity and communication collateral across print and social including original content as well as through website featuring social content. We leveraged our relationship with Under Armour to provide exclusive insight related to apparel and technology advancements. We also highlighted the many NFL alumni from the Terps program by having them serve as brand advocates to further enhance recruiting efforts. Lastly, we wanted to create an immersive brand experience when recruits entered the facility to reinforce #MarylandPride and #DMVtoUMD movement. The results spoke for themselves and the program had one of the their bests recruiting classes in recent memory during the 2014/15 and 2015/16 seasons through our partnership — It was cool to be a Terp. ©2018 Leverage Sports Marketing, LLC. All Rights Reserved.